The enterprise is in trouble. The size and value of data has grown exponentially, and the data itself is moving farther than it’s ever traveled. But data’s destinations aren’t nearly secure enough to withstand the increasingly sophisticated attackers looking to steal from the enterprise. 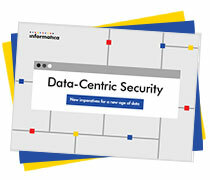 As data becomes mission critical – the challenge to secure it becomes more complicated than ever. Read ‘Data-Centric Security’ and find out what your organization needs to do to secure an enterprise that puts data first.